Through the first four innings I thought the Mets’ offense might be taking the night off again. But once the fifth inning rolled around, the Mets’ offense was able to get to Jaime Garcia and Matt Harvey/the bullpen did the rest. Overall it was an encouraging game. The Mets were resilient and won the series after that tough extra innings marathon loss. Harvey showed fans that he’s still alive. The offense put together a bunch of hits (8) and scored some runs (6) and it wasn’t all due to the long ball. The back end of the pen continued to look strong. It was a nice opening series win at home. Dark Knight Looked Great: Matt Harvey pitched 6.2 innings and gave up just 3 hits. Unfortunately both of those hits were solo homers by new Met Killer Matt Kemp (solo homers in 5th inning and 7th inning). Terry yanked Harvey after the 7th inning Kemp jack. Obviously he wanted him leaving feeling good about the start. And he had a lot to feel good about. He was sitting in the mid- 90s with the fastball, and he didn’t walk anybody. The Braves don’t have the best lineup in baseball, and Harvey certainly didn’t strike out the park. But he looked good considering he’s coming back from this crazy surgery. I’ll take it. Offense Responds: Harvey gave up that solo shot to Kemp in the 5th inning, but the Mets picked him right up and responded with two runs. 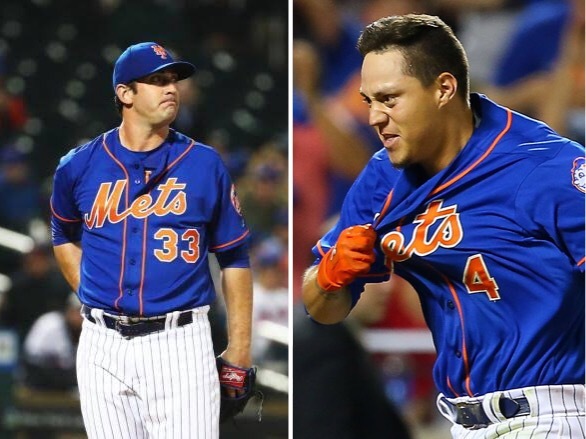 Neil Walker singled, Jay Bruce walked, and then Travis d’Arnaud launched a 2-RBI double in the left center field gap. Nice to see Travis getting in on the action. The Mets need him to be present on offense. He doesn’t need to be a force, but he sure as hell cant be the black hole that he was in 2016. Wilmer The Lefty Masher: Terry hit Wilmer Flores fourth in the batting order right behind Yo last night, and it was totally warranted because he continued his dominant streak against southpaws. Jaime Garcia walked Yoenis Cespedes with one out in the 6th inning and put a man on base for Flores. Wilmer promptly made him pay by crushing a hanging breaking ball just inside the left field foul pole for a two run shot to make it 4-1. Teams walking Yo is going to be a theme this season, so it’s nice to see the guy behind him making the other team pay. Hits! Hits! Hits! : Kemp added that solo shot in the top of the 7th but in the bottom of the 7th the Mets responded again. Michael Conforto was hit by a pitch with one out. Then Jose Reyes singled and Asdrubal Cabrera followed with an RBI single between third base and short taking advantage of the shift. Then Yoenis Cespedes hit a double play ball to the right side of the infield but shortstop Dansby Swanson made a throwing error to first base that allowed Reyes to score to make it 6-2. Salad And Reed Lockdown: Fernando Salas looked good in the 8th inning and was able to pitch around some defensive blunders (including one by Salas himself). Addison Reed dominated the heart of the Braves order in the 9th to close the game out. Today: Zack Wheeler makes his return to the mound after a two year Tommy John recovery absence. I’m excited. I remember how electric his stuff was a couple of years ago. And we honestly need him to contribute now. With Steven Matz going down Wheeler is no longer luxury depth. He’s a key contributor. Marlins come to town and send Wei-Yin Chen to the mound. Another lefty. Let’s go Wilmer! Let’s go Mets!